DAAD scholarships 2016 offer graduates the opportunity to continue their education in Germany with a postgraduate or continuing course of study. The scholarships also promote the exchange of experience and networking amongst colleagues. - a complementary course that does not lead to a final qualification at a state or state-recognised German university of your choice (not an undergraduate course). - The scholarships are awarded for the duration of the standard period of study for the chosen study programme (up to a maximum of 24 months). To receive further funding after the first year of study for 2-year courses, proof of academic achievements thus far should indicate that the study programme can be successfully completed within the standard period of study. - Applicants who are already in Germany in the first year of a postgraduate course at the time of application may apply for funding for their second year of study. In this case, it is not possible to extend the scholarship. - if necessary: Language course (2, 4 or 6 months) before the start of the study visit; the DAAD decides whether to fund participation and for how long depending on German language skills and project. Participation in a language course is compulsory if the language of instruction or working language is German at the German host institution. A special DAAD committee made up of professors from German art schools makes the final decision about scholarships in the fields of Fine Art, Film, Design/Visual Communication and Film. The decision is based upon written applications and work samples which have to be submitted. 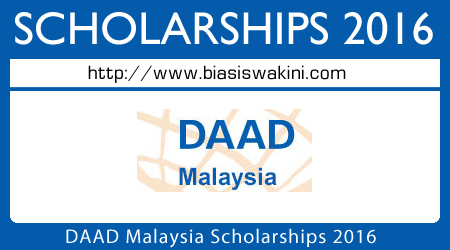 0 Komentar untuk "DAAD Malaysia Scholarships 2016"